Over the years we have used many different types of electronic tuners, starting out with the old “Korg” guitar tuner with the big six position selector on the front. This was only any good for an instrument with an electronic output, or an acoustic instrument fitted with a pick-up. Then came the “clip on transducer leads” with a 1/4 jack plug on the other end for use with pretty well any tuner on the market. Then more recently, a whole array of clip on tuners, most of which seem to work quite well. 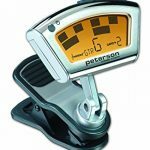 However, I have now acquired a “Peterson Strobo Clip” tuner. I can put my hand on my heart and say that this device is the best clip on tuner I have ever used. As an upright Bass player, I have to say that some of the tuners I have tried do not handle the low frequency of the “E String” very well and the only way to get anything like a good reading is to tune using harmonics. Not so with the Peterson! It responds perfectly to any frequency you throw at it, with a bright display that remains clear whether on a dark stage, under spotlights, or even in bright sunlight. I have been using this tuner now for over twelve months with no problems and although they are expensive, I would buy another without hesitation. Author DCB'sPosted on April 23, 2018 January 16, 2019 Categories PA Equipment / Music StoreLeave a comment on Peterson Strobe Tuner. We have long been huge fans of Bose sound equipment and for the last twenty five years have enjoyed trouble free, high quality sound from the legendary “Bose 802” speakers. At last we have found a UK music store that caters for not only our “Live Sound” requirements, but also everything we need in the studio. We have found the staff to be very helpful and knowledgeable. Bose PA Equipment for sale. Author DCB'sPosted on January 19, 2017 March 18, 2018 Categories PA Equipment / Music StoreLeave a comment on Bose PA Equipment for sale.